Is this a sport or a household chore? Ryan has an opinion. The Winter Olympics are upon us, and Ryan is fired up. Four years ago, he really took an interest in the hockey tournament at the Vancouver Games. And why not? With essentially six NHL All-Star teams competing (Teams USA, Canada, Finland, Sweden, Russia and the Czech Republic are composed largely, if not entirely, of NHL players), what’s not to love for a hockey-obsessed kid? It may not sound like a big deal (but those of us in the club know differently) but I was proud of Ryan for embracing the break in the NHL season and the idea of his favorite players competing for their countries. It’s the kind of change in routine that hasn’t always gone over well in our house. But Ryan’s Olympic spirit was confined to hockey. He didn’t care for bobsled, or luge, or ski jumping, or (heaven forbid) figure skating — only hockey. There was just one problem. Sometimes, he made plans to watch a game, only to find it was delayed by competition in some other event that ran long. There was one game — I don’t recall the countries involved — that Ryan had his heart set on watching. Game time came and he parked himself in front of the TV, only to find the screen filled with … curling. Curling is the epitome of a sport that most people only pay attention to once every four years. It’s oddly captivating on television, although I’m not sure the ice equivalent of bowling belongs in the Olympics. It can also be time-consuming. I assured Ryan the hockey game would begin any minute. The curling match went on, and on, and on. And on. I think it went to overtime. Or extra innings frames. Whatever it was, Ryan was not having it. He grew increasingly distressed that he was missing the start of the game. I tried to find it online, but the streaming of the Games was relatively new in 2010, and not without issues. I got the stream that was supposed to be the hockey game running, but it, too, was showing curling. Ryan and I settled in to wait. He continued to get upset and I continued to try and calm him. Finally, Ryan had enough. As we watched the sweepers sweep, he let his frustration out. The match ended, and the hockey game started. Ryan calmed down and watched. I don’t remember any other details. But as we prepare to embark on another Olympiad, I can’t even think of curling without a smile. Really is a weird sport. I agree. As you ,mention, people only watch this during Olympics. I’m one of those people. I love the combination of tactics, technique (to get it to curl or not curl, and stop where you want it too) and the randomness. I’m from sweden so I like that you used a picture of our team. 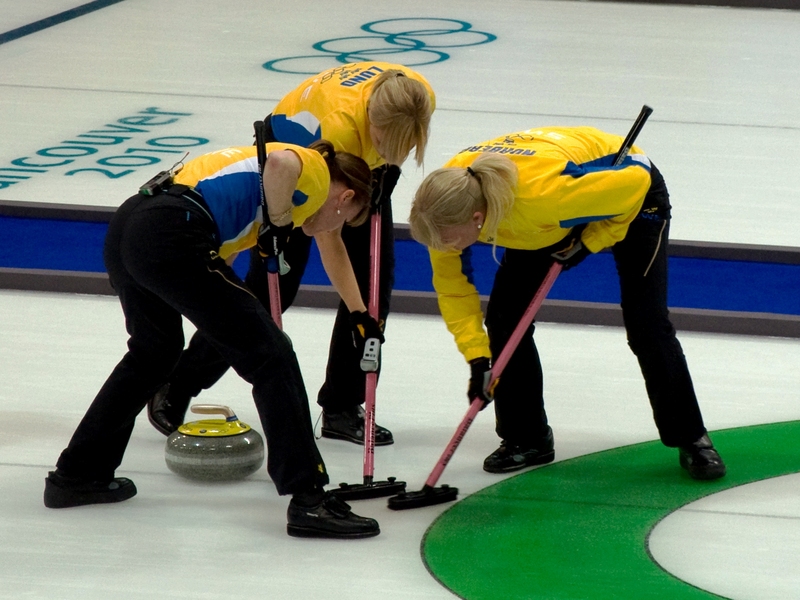 Sweden-Canada is a big game in Curling. I think curling is bigger here and in Canada than in the us. And to present myself: I have been following your blog for a while, and also read older posts. Found it when I searched for something about autism. Don’t remember what exactly. You see, I have aspergers, and I talk about how to meet children with autism spectrum disorders as a scout leader. This blog inspires me.